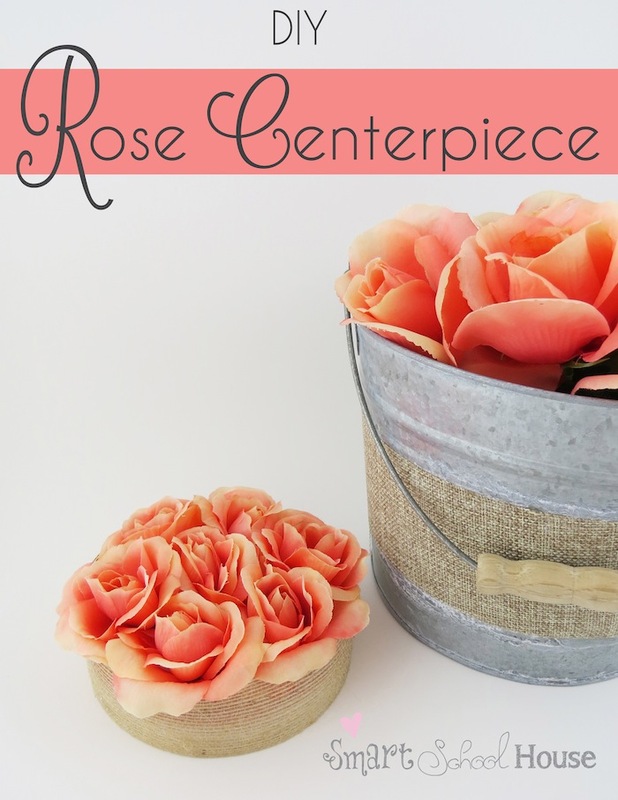 I love a pretty DIY project! 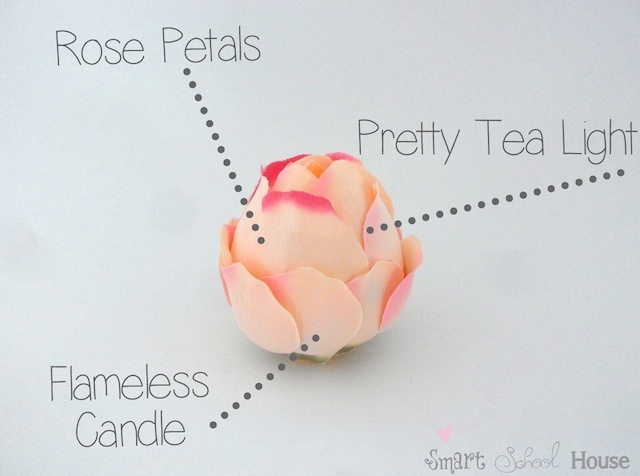 Let me show you this beautifully easy project called DIY Flameless Rose Tea Lights. 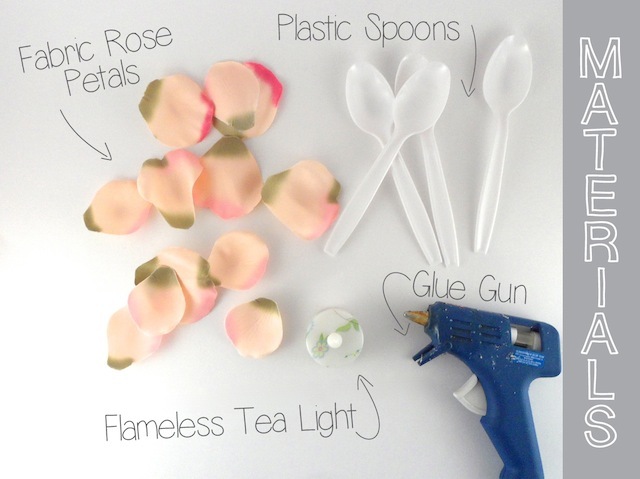 You will need fabric rose petals, a flameless tea light, and plastic spoons! Get ready, you’re going to love this DIY project! 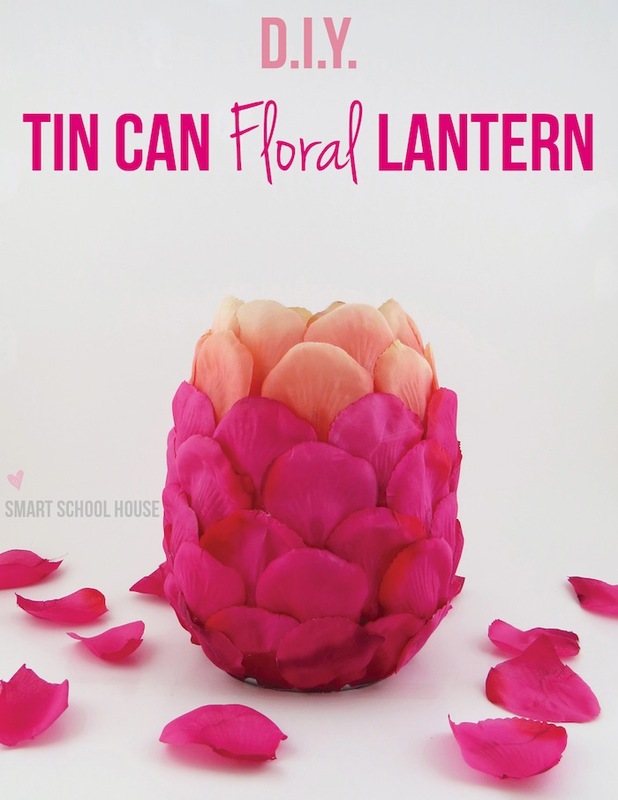 This project was such a hit that it even landed me a spot in All You Magazine where I used the same technique to make this project: DIY Floral Lantern. 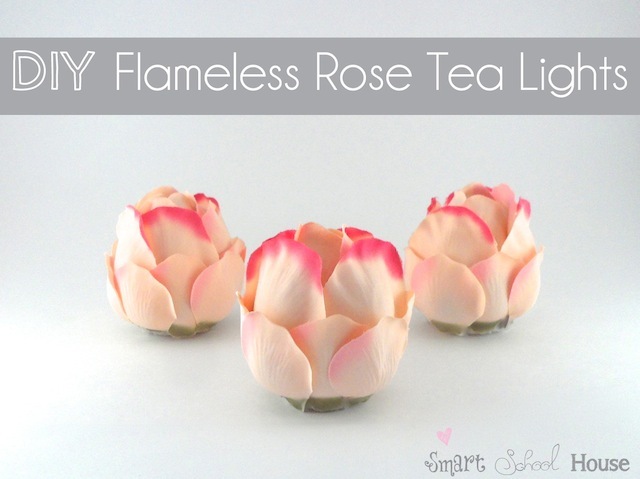 Just imagine these DIY Flameless Rose Tea Lights at your next special event! A wedding, a shower, a birthday, a dinner party, the options are endless! These tea lights are also the perfect DIY home decor project. I have these candles in our guest bedroom! How awesome is this idea?! I love them. So cute and perfect for valentine’s day/spring. What a cool idea and they’re so pretty. What a great idea and no flame needed for this romance! So safe with little ones around too. Cheers. Such a great idea. So clever and creative! I was so relieved when I read “flameless” … I was picturing my Valentine table going up in flames! 🙂 Those are so pretty … and they’d be great for so many different occasions! So adorable! Perfect for V-day! Thank for sharing! What an awesome idea. Love it! Wow! What a gorgeous idea!!! It came out so beautifully. What a cute idea! Thanks so much for linking up! You are so creative! Thanks for linking this up to Manic Monday. Have a wonderful week. I do a lot of events where we can’t have an open flame so I love, love the idea of dressing up the ugly, plain flameless tea light. Thanks for sharing over at Finding the Pretty & Delicious Linky Party. I hope you’ll visit again tomorrow! fun pretty and a lovely tutorial! Thanks for sharing! You will be featured at this coming tasteful Tuesday link party. Thanks for joining us at Nap-Time Creations. Hope to see you there Monday night when the party open again. I’m thinking about making these for decorations at my wedding! How many spoons and petals did you use per light? thanks so much these are so pretty! What a beautiful result! Clever! Excellent idea! Luv it! Pinning it now on my Board! That’s ingenious. Love, love, love it!! those were you??? I saw these circling Pinterest and was like…”how fabulous”. Of course they were you :). How can i make these float in water? Those would really be pretty made up for tables at a Wedding reception, using the colors of the Bride!! what a simple and creative idea. i can see this becoming part of gift baskets in the future. this is great!I can get all of these items at the dollar store. Absolutely love these. I am hoping to make these to put on tables for my wedding reception. About how many petals did you use per light? I want to make sure I can find enough flowers. & about how long did they take to make? Thank you so much! We are heading to the store today so we can try this out. I`m really excited! I`’ll have to let you know how they turn out. SO clever! I love all kinds of tea lights, but my husband refuses to have candles in the house because of the danger. Now I can make some myself – never knew they had these little inserts. I guess I can get them at Michaels? Soo beautiful! Looking for cute girly things for my daughter bauptism that I can do on my spare time and save myself money on deco. 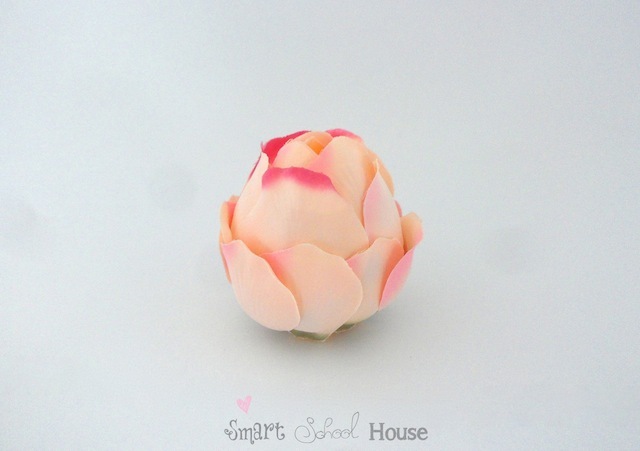 this is certainly one imma use with different color petals! Thanks! I loved this idea and did a similar project myself with my daughter. I didn;t ahve spoons so used just artificial flowers, and I also added some scented oil to create Scented Flameless Candles! I’ve mentioned you and linked back to you in my post. Thanks so much for the inspiration!